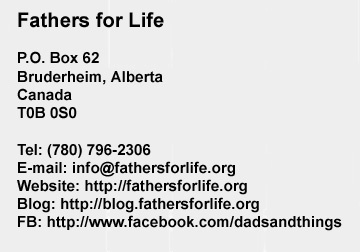 If you wish to write to express your displeasure with the contents of the website of Fathers for Life, refer to the warning message at our home page and make certain to read our disclaimer. The conditions specified in the disclaimer will apply to what you write in your message, especially if you do not exercise diligence and instead express uncorroborated assertions or allegations. The information accessible at Fathers for Life is based on facts, not on fiction; therefore provide facts to back up your counter-claims and criticisms, and don't provide sophistry or unsubstantiated opinions. No one has ever come forth to take on the work necessary to run the blog, and I can no longer focus on it. I am getting on in age, and it is becoming steadily more difficult to stay on top of things. The blog had been closed for comment, but, with the host server for Fathers for Life having migrated the blog to the latest version (3.5.1) of WordPress, that part of the work I do has become easier again. The blog has a new look, and it is possible to keep the enormous number of spammer-subscriptions at bay. The blog is again oen for comments. Unfortunately there are not very many of then now anymore, although the traffic to the blog is increasing once more. Still, as long as I am around and capable of paying attention, anyone interested in leaving comments about anything regarding fathers rights, the contents of the web pages of Fathers for Life or the blog entries at Dads & Things, those comments can be made through my Facebook page and at the blog. Although efforts are being made to read all comments or responses, no guaranty is given that there will be a reply to any responses made at my Facebook page or at the blog. I reserve the right to decide whether a subscription request will be honoured or whether any subscriber will remain subscribed. Before you comment on my Facebook page or ate the blog, consider that the following rules apply. Make no ad-hominem attacks (any statement that appeals to feelings or prejudices rather than intellect or is marked by or is an attack on an opponent’s character rather than being an answer to the contentions made). Do not swear or use vile language. Do not call for revolutions or assassinations. Do not deprecate ethnic or racial origins or traits. Use facts and logic in your comments. You will not be permitted to point to any location of information without stating which specific item of information at that location it is that you refer to and wish the reader to look up. In addition to that, you must also state sufficient details that will enable anyone to find with ease the exact location of a specific item of information you are using to illustrate or support your point of view. Do not troll or pile on (to pile on is to respond to an argument without properly answering a point that was made but to offer instead more opinions that are not or at best remotely related to the contention). Postings may not contain or point to advertising. Comments that do not meet all of the preceding rules will be removed. In the event of any disagreement with any of these rules, the moderator (that is I) has the last word. Repeated offences against those rules will result in the poster being banned. If you look for advice on anything of a private nature, call the telephone number identified at the top of this page.